To create a simple “Hello world” program. Create code to move the sprite around the screen. Using the “pen”, draw shapes on the screen. To begin with, we’re going to look at ways of giving instructions to a computer. Click here to visit RoboZZle – a programming puzzle game, which requires you to create a sequence of instructions for a Robot to follow. Look how very complex behaviour can be created with a few commands. Each level you complete of Robozzle needs you to think about using a very small set of commands or instructions in a particular order to complete a task. This is problem solving (more of this later). Now you’ve looked at using a small set of commands to solve problems, we’re going to look at something a bit more useful. 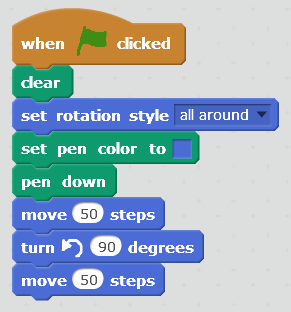 You may remember using “Scratch” at primary school for simple programmes. Now we’re going to use it to write more advanced code. This is a graphical programming language, in that you drag small pictures of code (or blocks) which snap together to give you a set of instructions. This is basically a more complicated form of RoboZZle. As you study more computing, you will learn to use text-based languages, where you type commands onto the screen. Now we’re going to look back at Scratch which is a great starting point for more serious programming. 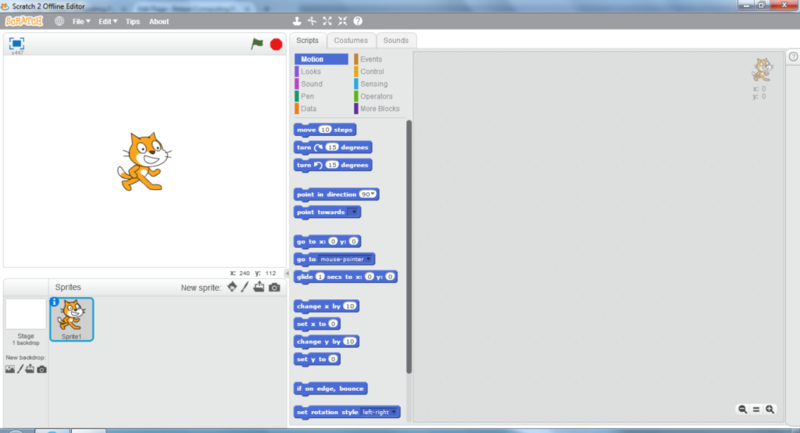 Open up Scratch (click the Start button, select “All Programs”, then “PROGRAMMING”, then “Scratch” and click on “Scratch 2”). The first time you run Scratch 2 it may need to set up Adobe Air, let your computer do so. 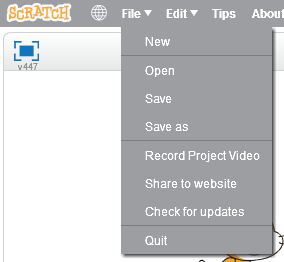 If you get any messages about updating Scratch just click Cancel. 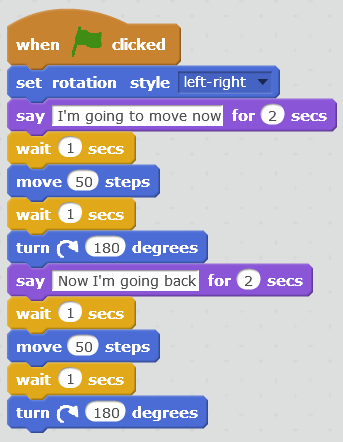 Looking carefully at the colours of these two blocks of code, (you have a colour-coded menu at the top right) drag the blocks from the left hand side of the screen into the empty space in the middle. Now click the green flag at the top right. What happens? Can you make the cat say “Goodbye” for 5 seconds? and click the green flag. Why do you think we need the “wait” block in the program? It is vital at this point to start saving your code. Make a “Scratch” folder inside your “Computing” folder in your H: drive. Make sure you have selected your “Scratch” folder on your H: drive. Make sure you save your code regularly from now on – don’t run the risk of loosing your work. then click the green flag. What happened? That was easy. Change your script to draw a whole square. Change your code to draw a second larger square in a different position. Take a screenshot of your “Two square” code (ask your teacher if you don’t remember how) and print it out for your book/folder. You should write some notes explaining how the code works, and what the different blocks of code do. Make the sprite output (say) “Drawing a square” before it starts, and “finished drawing” as it completes each square. Now add a triangle to the picture. Perhaps you could make it spell your initials?